Founded on 11 August 1786 by Captain Francis Light, Georgetown has now become the capital of the state of Penang. The island, derived from the many betel nut palm (Pinang) which can still be found to this day, has been transformed over the years to become a bustling port and generated wealth from its diverse entrepreneurs creating cultural melting pot. Georgetown or ‘George Town’ was named by Captain Francis in honor of the late King George III, which is still being used today. Due to the many unique architectural and cultural gifts, George Town was designated a UNESCO World Heritage Site in 2008. Georgetown, being the capital in Penang and due to its strategic location have established itself as a cultural melting pot on the island. The town is filled rich with its diverse culture which can be seen anywhere around the area, from the façade of the buildings to the richly flavored foods you can taste all around Georgetown. By the time you reach Georgetown, you can enjoy a trishaw tour around the city with the peddlers acting as your very own local tour guide, and would be happy to make a few stops along the journey for you to take a closer look. These trishaws can be easily found all around town, especially where the major tourists spots are. For those who are eager to take a moment off the city scene, few hotels around Georgetown can arrange a tour for you to go to the uninhabited monkey beach island, activities includes jungle trekking or fishing for the enthusiasts. Meanwhile for the golf lovers, the Bukit Jambul Country Club that is rated the second most beautiful golf course in Malaysia by Golf Malaysia magazine can be a good golfing option. A World Heritage site like Georgetown, does not only offer to tourists the beautiful and unique architectural sight, but also the strong and vibrant local culture you can feast your eyes on. Used to be the tallest building in Malaysia, the KOMTAR Tower (Kompleks Tun Abdul Razak), is still dominating the skyline of Georgetown for a good birds-eye view of Georgetown, this spot is a must visit. Many tourist deemed traveling by foot is the best way to discover Georgetown, this is especially very true on the must visit Heritage Trail taking you around its main historical sites and colonial buildings. Along the trail you can find many of the town’s unique buildings from the Queen Victoria Golden Jubilee Clock Tower, Fort Cornwallis which was build two centuries ago, to the more locale building of Cheong Fatt Tze Mansion and Lim Lean Teng Mansion. For a taste of Bollywood movies, there is the last remaining film theater screening mainstream Hindi movies, named Odeon Penang (or Iswaria Veenai Odeon Cinema). As most of Penang immigrants in the past were Chinese, you can expect spectacular Chinese building built for more than 100 years ago. Khoo Kongsi (Khoo Clan House) is one of Penang’s most lavishly decorated kongsis, built 650 years ago, the Khoo Kongsi is one of the five biggest clans in Penang. Located further away from the city center, standing on the hill-top at Air Itam (next to Penang Hill), is Kek Lok Si Temple. The temple, also known as “Temple of Supreme Bliss”, is also the largest Buddhist temple in South East Asia, standing magnanimously the temple has attracted many tourists from all different backgrounds. Georgetown is a famous tourist spot in Malaysia, thus finding the right hotel for you will be a breeze. One of the more famous hotel will be Eastern & Oriental Hotel, often called as E&O, the building itself has that old world charm and also boasted the world’s longest sea-front lawn. For the more of local experience, the 1926 Heritage Hotel consistently receiving good rating in Agoda website, having great hotel services and also rich local essence is also not a bad choice. Close to all the city attractions, suitable for family and business travelers. 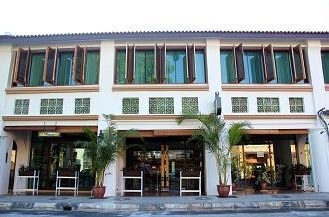 A family friendly heritage hotel located on Burma Road. Most part of the Georgetown are accessible by foot, which is also the most preferred transportation mode of tourists who would like to immerse with the local culture. Besides walking, there is also the classical mode of transport called trishaws which is easily available all around Georgetown, this mode of transport will easily access all around town without being stuck in a bustling city. And of course there is no shortage of the modern day transportation if one prefers it, such as the many taxi services, and also automotive rentals from cars to vans which can include drivers who can also be your tour guide.